NARRATOR: On this episode of The Rural Golfer-- Elk saddles up in Texas. -We got more moves going on than a can of worms right here. NARRATOR: A couple of world championship ropers will show him the ropes. -Him navigating my horse around was pretty funny. -I'll kick him make him back up. NARRATOR: And in his element, he'll take the bull by the horns with some golf tips for them. -I know how to make my rope do what I want, and I know what mechanics of the rope. When I play the golf, I have no idea of the mechanics. -There's an old saying in golf that you've never seen a guy play bad with a good grip. Very good. That's pure. THEME SONG: One, two, three, fore! We got the Big Show revvin', our eyes are on the map. Where we're goin' next we just can't say. So grab your clubs, let's hit some balls. We're makin' friends and playin' golf. The Rural Golfer's comin' your way. -He's got more gold buckles than anybody. Obviously got the game. -You're only good as, uh, as your header. You know, and Nick's a great header. -I rope a 600--pound steer. And I roped him around his horns. And then, uh, my job is to do it in a fairly timely manner. Whenever I leave the roping box, I've only got four or four and a half seconds, five seconds to rope a steer. -When it's right is when the header gets a good start at the steer. -And then I have to rope the steer around the horns and I have to handle him off properly and calmly where he's easy to heal. My partner comes and he ropes both feet, hopefully. And whoever's fastest wins the most money. In the roping, then cattle that you draw makes a big difference, because you can go along there to a couple rodeos and don't draw the right cattle. And then all of the sudden, you get to one rodeo and you draw the perfect steer and he stays out in the middle of the ring and you make a great run on him. And then you just get to rollin' right back again like that. -Rich, this is your spot right here. -Yes, sir. I live about two hours from here. -And we're in the middle of Texas here. Boerne, Texas right? -Yes, sir. We're at Tapatio Springs. -So last year, Rich and I and-- and Nick, we met up at the American where you guys had a chance to win that $100 grand. That was-- that was a good time together. -And, uh, you know, playing on tour, and you guys were doing the same things, and it's a game of changes and adjustments, right? All-- all day long. And today we're gonna do a few things. We're going to try to show me what you do. And I'm going to have some questions, just questions, because I'm curious about what you guys are doing. NARRATOR: At first, you may not see many similarities between golf and the rodeo sports of team roping, but after sittin' a spell with these two cowboys, we bet you see otherwise. -With the ropin' and the golfin', it's all pretty similar. You have to line up to the ball the same every time. With a headin' or heelin', you have to get in the same position every time. It's all about positioning, it's all about keeping your shoulder square with your target, and your follow-through. NARRATOR: As a member of the Professional Rodeo Cowboy Association since 1986, Rich Skelton is highly respected in the industry for his consistency and competitive nature, traits that brought him a record eight consecutive world championships from 1997 to 2004. -I've always just wanted to rope. With have-- we pastured cattle and things like that had to be doctored, so I knew from early age that's what I was going to do. -He's one of my heroes. When I was just coming out of high school, he was winnin' all these championships. He was a world-- eight-time world champion, and one of the great healers of all time. NARRATOR: After claiming the PRCA's rookie of the year honors in 2000, Nick Sartain earned the world championship title of his own in 2009. Having partnered in 2012, Nick and Rich now compete in 75 to 100 events each year. -Now for me to be able to rope with him and travel with him and Rodeo with him's kind of-- pretty surreal, you know, that I got to see him do all that. And then now I'm actually ropin' with him. -We go along, rope, have fun, try to make a living. Hopefully we get another championship out of it. -The main thing is your horsepower. You obviously have to rope well, and you have to have work ethic, and you have practice a lot. But you have to have good horses. That's really the deciding factor. You know, you don't see a guy win a lot of races racing cars if he's got a busted up car. -It's a detail business. And I think that's what's interesting about the-- their job, is that they don't ever have to runs the same. And in golf, we don't ever have two shots the same. -Oh yeah. That's how you do it, boys. That's how you do it. Everyone has their fears of different things. [GRUNTS] And I could probably live the rest of my life without being on a boat or a horse. I need plenty of lessons because this is only about the fifth time I've been on a horse. -It was pretty interesting to see him. And it's fun to see him out of his element, because he's such a confident guy. ---just coming around the corner there. All right, so I got to make my horse go this-a way. -Come on. Let's go. Here we go. Am I? -Whoa, whoa, whoa, whoa, hey. Whoa, whoa-- hold the bus. Hold the bus. -Pullin' the reigns. There you go. -Whoa, whoa, whoa, whoa, whoa, whoa, whoa, whoa, whoa. -Now kick him, make him back up. -He's got retreat, too. Yeah. -He's got a little Quigley in him. Yeah. -Come on, let's go back. -This way. Come on. Here we go, here we go, here we go, here we go. Whoa, whoa, whoa. OK, there we go. That looks good. 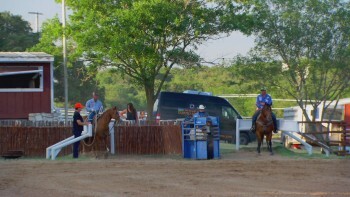 -He was pretty intrigued when he picked up on the reins and the horse backed up. He liked that. NARRATOR: Tucked away in the hill country of South Texas, the city of Boerne is mere minutes north of San Antonio. German immigrants first settled this land near the waters of the Cibolo Creek more than 150 years ago. -Boerne is growing all over. It's just-- it's a great community. It's small enough, yet it's so close to downtown San Antonio you can be at a Spurs game in 35 minutes. Or you can close your gate and feel like you're in the middle of nowhere. So you-- you have the best of both worlds. NARRATOR: Once known as Thunder Valley, Tapatio Springs Resort was purchased by Tom and country music legend George Strait in 2011. -George kept asking me are you still looking at Tapatio? He came by the office one day and I said well, come out. Drive with me and we'll drive around. So we drove around. And he just seemed really interested, and that's when I said hey, do you want to be a part of this? And he said sure, he said, uh, I think it could be a really neat deal. He's been very hands-on, active. Loves this place, too. I mean, you can see by the surroundings. Were set in the right spot. One of the-- my favorite holes would be number 12. It's a par four. You have to carry a pretty good drive over a ravine. I can't tell you how many people from Houston, Dallas, uh, out of state-- when they drop into this little valley, it's almost like there's a huge burden just lifted off their shoulders. There-- a sigh of relief, they can sit on the patio, have a glass of wine, watch the deer, play golf, and just chill out. I mean, we want this golf course to be one of the best in the state. And we want people to come here and go wow. A lot of the folks that come here said we had the best time of our life. We had the best round. This golf course is challenging, but it's also fair. I had a great round and I'm coming back. -You guys are so, um, in tune with your hands and fingers and wrists that as a coach today, I've got to use that. I've got to use your strength of what you guys are good at. -They've got to be able to go through that first drill to where they can know that that's going to go straight if they do that. Then I can add power, I can add how the a-- you know, of that can be attached on. But we got to start right here. -Ugh, this is painful for you to watch, isn't it? -The only way that you're ever going to get great at golf is we got to-- we got to get the grip right. It sits where the-- where the fingers meet the palm. And the only thing that you really have to make sure is you get that meat of that hand, that thick bit, to be able to squeeze down. So if you-- if you cut off all your fingers except for your pinky and you-- next-- you'd want to have it where you could get the club balanced like that on top. We always said that if you zoom in here, Greg, you can see the calluses on my hand is between the first and second line on-- on my hand here. We always said golfer's a golfer because he drew lines on our hand where the club sits. So the right hand grip's more difficult. So I sit it literally right on the tips there. So when it closes-- and this is very hard to get-- but the whole reason I'm doing this is to get the palm against the back of that club so that the palm is going where I'm going. Yeah, he looks good over the ball now. Atta boy. -I always misinterpreted that it was my left hand that I need to be doing my work with and understand that my right hand grip made a big difference in my accuracy. Very good, stay there. -I don't want anyone to be intimidated by golf. I want people to see this show and-- and think they can do it, and enjoy it now and just watch it. -You don't have to pull back. -I should just worm burn it down the middle. -Yeah. You're not-- you're not going to worm burn it anymore. -What makes a rope want to fly? -I don't even know how to hold it right, do I? -Yeah, let me show you. -I feel like I'm the only one in Texas at the moment that doesn't know anything about this rope. -There you go. Hold that. Put your-- put your coals right there together. -This is called your spoke, how much you have right here between your hand and your eye. -From right here to right here. -OK. The bottom part of your hand controls the bottom part of this loop. --top part of your hand controls the very top part of this loop. And when the steer's horns, it just like-- you want your rope to come in at an angle just like this so you rope everything coming across the horns. It's just like golf. It's all about your angles. If your angles is correct, ropin's easy. -The cow comes out. He's got to react which way the cow went right out the gate. -Whenever I leave the ropin' box, I've only got four, four and a half seconds to rope a steer. Everything has to be muscle memory. My horse has to be tuned and in time with me. And Rich on his horse has to be in time with what I'm doin' and what I'm doin' with the steer. -This right here, we need the brakes. -So I got to hold that and that? -There's a lot going on, yes. There's a lot going on with the-- I had to hold the rope here. And I also had the rope here, and I had to hold-- to get the circle in a correct spot. And I got that thing danglin'. And I'm thinking about the cow and I've got the reins also with this thing, and I got rope across here. -Just come all the way across the horns. -Stop him. Stop him. Pull back on the reign. Pull back on the reign. -Hey, there's a lot of things goin' on here right now, OK? -That was some great first loop, first kill. -Good ball, Nick. Right down the middle, mate. -It went from being painful to watch, to actually oh, look at this kid. He can actually hit the ball. I mean thats-- that's gotta be way better. And it felt better. -Hey, that was pretty good right of the gate. Nick, you made-- you've gone from being all worried about you game. And now you-- you've just laced one down there 2-- 250. -I'd say that's pretty good. -Like me yesterday with the rope? -I don't want you guys just to be able to hit it, I want you to guys be able to smash it. -You have the idea of being athletic and doing what you do, but I want you to feel like you're winding. -I want a coil. I want you to coil. And then I want you to release it with the legs. And that's what releases the coil. This rubber band is the easiest way to describe how a gold swing works. If I wind the top and hold with my legs and then on the downswing I lead with my legs, there's-- there's some potential there, right? -Let it go, there's some-- there's some zip there, right? -That's how I hit a ball. -When I play golf, I never use my-- none of my lower body. And then so with the rubber band, it broke it down in showing us how that actually works. -So when I get the-- when I go to the top here and I transfer that, all of this power is transferred straight down in there. They're using a coil-recoil action, like a snake. They coil the top half of their bodies with the shoulders, they resist with their legs, and then they lead with their legs and that transfer all that energy into the ball. Atta boy. That's easy for you now, isn't it? -Mm-hmm That felt a lot better. -When they leave here, they can go back to their friends out on the rodeo circuit and say well, you played with golfer Steve Elkington. He's a good player. What-- how does he get power? Well, they know now. Nick, you're a big guy, man. You should be out a wind up this and really do some damage to it. -When he started talking to me about the club face and using my wrist more, and then the timing of transferring my weight, that made a huge difference. Because then I was able to tell get some power on the ball and actually get it up off the ground, and that made all the difference. -Look up with your eyes, is kind of where you're goin'. There you go. And there, that's a nice adjustment. Do it again. Look up again to the flag. Move around. You feel like your right hand's pointin' where you going. That's right, that's right. Wind it up, wind it up. Atta boy. Atta boy. That's golf. -Now you have the grip. -Because You have a-- you have a very particular idea about the stance. -I do. I think that if you and I are gonna run a race, and I can't run you from standing right here. I have to get ready with my intentions to run, so I have to get my body ready to run. So I have to get in this position. And this position right here is pretty close to where you want to be when you golf. You want your-- you want this foot to be there and this foot to be a little bit open. You put the thing right in the middle. -With rich, he's played a fair amount of golf, so we had to get him on track. And then we had Nick Sartain, who's basically a beginner golfer. And that was good, because Nick doesn't have any bad habits. -Nick Bennett really-- beginner golfer. He wants to be a golfer. He now has a very basic understanding of what he has to do when he goes to the golf. And he can get a ton of enjoyment out of it. Man, you're on fire today, though. Good work. -Elk showed me how to hit the ball correctly and my grip and some basics about my swing and stuff. And I actually got to hit the ball and it went up in the air. It was pretty fun. -Get in the clown's mouth. -I've played quite a bit. But I've self-taught. I would hit the ball, and hopefully it went where it was supposed to. 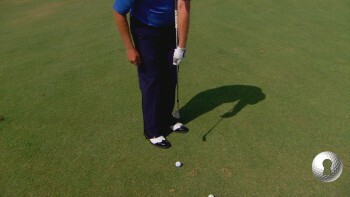 When he showed me and kept it simple, the driving felt pretty good and the chipping got pretty good. But 120 yards out or so, Ed's doing very good. But he says it'll get better and I believe him. -Yeah, well played. Good work. -Like you've done that before. -Guys, thanks very much for the day. -Thank you for the instruction. -I got the scores. We're gonna keep that to ourselves. -I'm-- I'm a little saddle sore from yesterday. -I think today was my job was to get them to where they'll love it more. -And I can see after he explained to me, you know, transfer my weight through my belt buckle and how much that was moving. And he's such a good teacher and he broke it down so easy that I can see the importance of my legs right off. -They've got some things that they've got in their heads now about golf to where they'll go on and enjoy the golf more. -You know, usually I just hit it and it just scoots across the ground and everybody laughs at you. And said hey, I was hittin' it. And you guys were like oh, good job. That's nice. So it made a lot of difference. -Those boys put me up on that horse, I had no choice. And, of course, there wasn't much going on as far as, I didn't have to do a great deal of things with it. But it was still intimidating to me. I'm, uh, I'm more worried about being on the horse, and I'm more worried the glove. I got a lot going on here. -Rich, get his-- get his coil over here. -So now I'm-- I'm doing it. This motion? -That's pretty close. Turn it over. There you go, you got it. -I got about eight caddies here. I'm thrown over there. Maybe nine. I got a lot going on here. What I'm gonna say tomorrow, I got a lot going on here. Yeah, look at the horns. There you go. -Swing all right? I mean, I want to be able to hula hoop a suburban right here with this thing. -[GROANS] How'd I do it the first time? Beginner's luck? -I didn't seal the deal. -Lot of stuff goin' on. NARRATOR: On the next episode of The Rural Golfer. -You know Omaha? Basically named Oma-ha. That's from the Omaha Indians just call it against the current. NARRATOR: Elkington touches down with legendary Heisman winner, Johnny Rodgers. -First Heisman winner from Nebraska, and the first to win the trophy as a receiver. -You told me lots of guys have got national championship rings, but hardly anyone's got one of these, right? -I noticed later on in my life that a lot of my running style was because of the rooster and runnin' from the geese. -You had to put the zigzag on him. -I had to put the zigzag on him. NARRATOR: --he's still got a few haunts to conquer on the course. -You told me already that you don't like bunkers. -Sometimes it takes three or four times to get out of here. -No, no. There's just-- no more of that. -If you believe you can or if you believe you can't, whatever you believe, you're right.